The great scholar Benedict Anderson‘s posthumous memoir, A Life Beyond Boundaries, is now available for purchase. It promises to be an exciting read by one of the most influential scholars of Asia of our time. I have not yet had the chance to read it, but already I have heard the stir caused by one of its most striking claims: that Anderson coined the term bule as an epithet for a Caucasian person. Bule is a slang pronunciation of the Indonesian word bulai, which means albino. 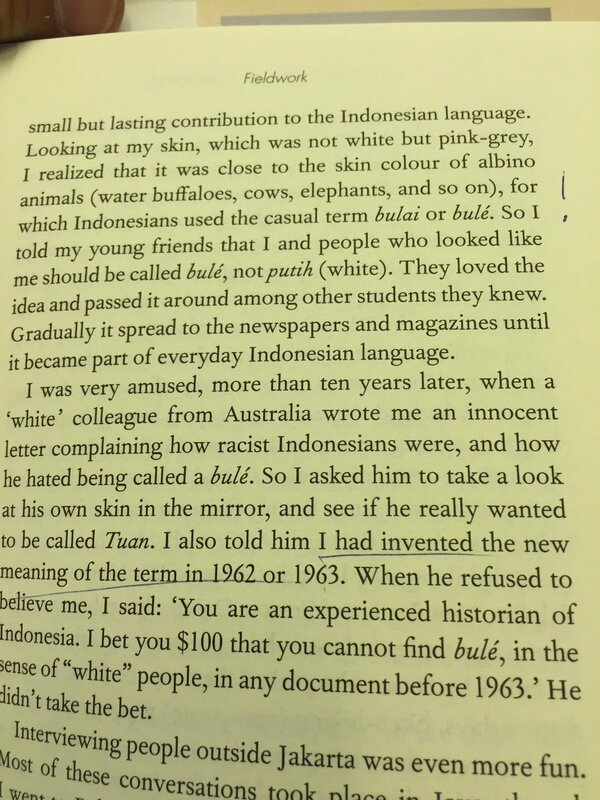 You can see how it’s used by doing a Google image search for kerbau bule [= albino water buffalo]. In common parlance, bule is a semi-derogatory term for white person, akin to something like “whitey” in American English. At least it used to be an epithet: I think that for my generation, bule has lost most of its power as an insult. For example, there was an old bar in Jakarta called Bugil’s, which is both a portmanteau of bule gila [= crazy whitey] and also the Indonesian word for naked, and it was a famous expat haunt (I remember short pours of watered down bourbon). In this sense, bule is like queer in American English, a term that has been appropriated by the community against whom it was directed and thus has lost its ability to be an insult. Equivalent terms in Hong Kong (gwai loh), Singapore (ang mo), Malaysia (mat salleh), and Thailand (farang), to my knowledge, have not been so embraced by their target community. Not only does Anderson claim to have invented bule in the early 1960s, he challenges us to find an earlier use of the term. I have found such an instance. I found it originally with a Google Books search for the words bule and Djakarta, restricted to anything published before 1965, on the intuition that if the term would be found it would be found in a book using the Dutch spelling. The source is a book by W. le Fèbre entitled Taman Siswa: Ialah Kepertjajaan kepada kekuatan sendiri untuk tumbuh…, published in 1952 by Balai Buku Indonesia. Happily, the Cornell library has the original book so I checked it out, and here’s what we find on page 17. The meaning is very clear: “wong bule” (orang putih) is best rendered as “honkeys” (white people) in American English. 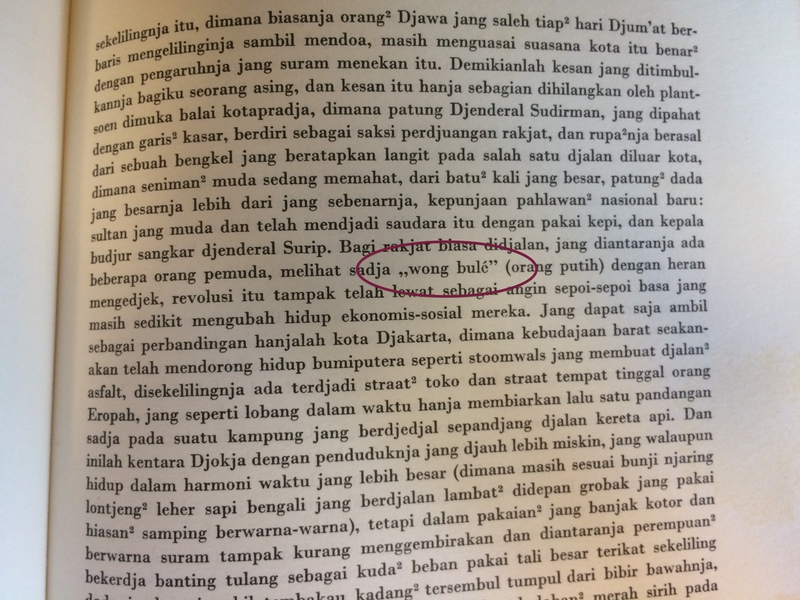 An interesting footnote to this find is the context of the quote: it is describing the sentiments of youth during the time of the Indonesian national revolution, seeing wong bule as confused and unsettled by the social upheaval at the time. That community and that time period is exactly the subject of Anderson’s Java in a Time of Revolution. A nice parallel, reinforcing the power of language in a time of revolutionary ferment. Now, my finding this quote does not reject the possibility that it was Anderson’s use of bule with his friends that is responsible for its prominence today. But it does directly challenge Anderson’s claim that “bule, in the sense of ‘white’ people” cannot be found prior to 1963. Wow! That is a much more amazing finding.